Despite the growing discussion whether palladium bullion bars might become strong competitors to gold bars due to gold’s currently high market value making it impossible to buy them at the moment, palladium bullion investment is very unlikely to become as active as its gold counterpart. If you look at historical trends, people have always favored gold and silver coins as means of payment and never palladium coins despite the fact that palladium metal is much rarer in nature than silver and gold. Palladium is a precious metal belonging to the platinum family that was initially believed to have no value. Only 2 hundred years after that it was discovered that palladium possessed superior non-corrosive and non-reactive properties which makes this white metal indispensible in the automotive and jewelry manufacturing industries. Palladium precious metals prices are driven almost exclusively by manufacturing demands and by insignificantl investor activity. 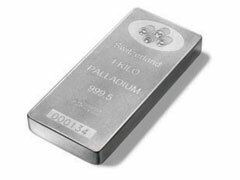 If you do wonder about palladium bullion bars, try to buy exclusively from well known sources and respectable bullion dealers to avoid fakes and palladium scams. Some of the good palladium bullion bars choices to consider are PAMP Suisse 1 and 10 oz palladium bars, Johnson Matthey 1 oz palladium bars and even massive 1 kilo PAMP Suisse palladium bars. Palladium bullion bars investors should be aware of the fact that their investment will never be able to reach gold or silver’s superior liquidity and should carefully evaluate their palladium investment decisions. In addition, palladium bullion bars or coins can never be bought for survival purposes hoping they can serve as means of payment. As history vividly displayed, it’s gold and silver that serve as main means of survival when paper money loses its value. When considering investing into precious metals bullion, set aside no more than 5-10% or your investment portfolio for this type of investment.